I love retro and I am sure so do you. For one thing, it reminds me of Audrey Hepburn and Grace Kelly and their classic beauty. Also, it is always nice to give tribute to the past, as there is no future without remembering the old days. I am not saying that from now on, in order to survive, we ought to constantly keep in mind the past events and praise their significance over and over. I just mean that along with keeping up with the time, we need to look back once in a while. Plus, retro style is something many ladies like to experiment with. Free People, well aware of this fact, released a new lookbook which is inspired by the retro icons of fashion. The name of the newest catalogue sounds very challenging indeed. But I doubt, the creative director really had a goal to provoke any unrest in the world of beauty and fashion. 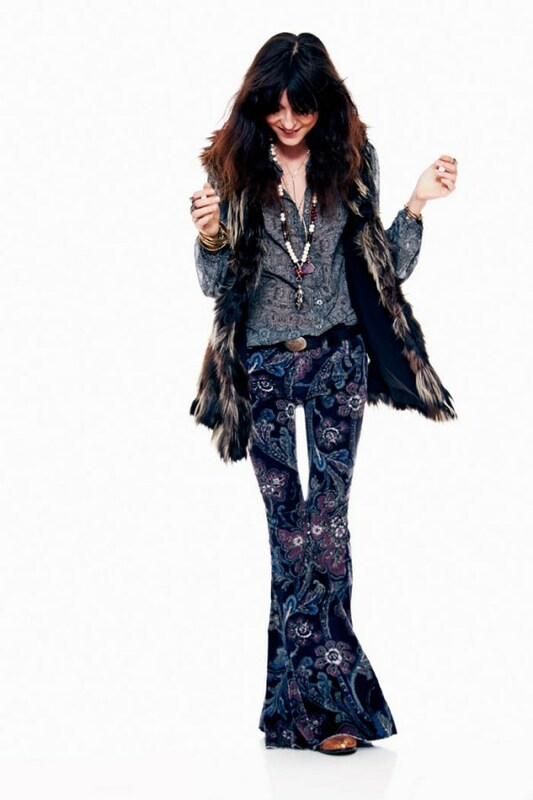 Janis Joplin, Twiggy, and Patti Smith served as inspiration for the stylist of the lookbook. Irina Lazarenu wows in gorgeous outfits from the latest lookbook. Free People offers a number of clothing pieces featuring vintage style. A midi dress in black with lace hemline is paired with white socks and black low-heel shoes. A white and black pleaded coat also adds to the retro taste as well as the model’s elegant hairstyle does. Here is a very bold look by Free People. How many of you would dare to sport a pair of old-fashioned floral pants with flare bottoms and a matching chiffon top with a fur vest, black belt and brown shoes? Also, the outfit is accessorised with a bead necklace, a range of gold bangles, rings and delicate lockets. It is more hippie than vintage, but after all, hippie is not a new style. Free People Channeling Icons lookbook has not that much to offer in terms of many outfits, but what it presented satisfied me a lot. Hopefully, you will have the same attitude, after checking out the gallery.